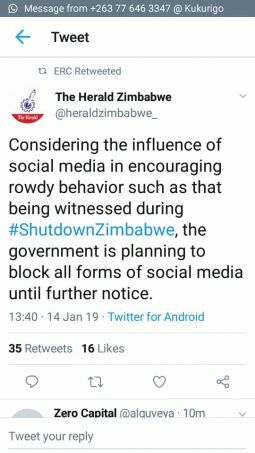 Just with the coup that was not a coup, and typical of the era we live in, fake news and the current #ShutdownZim / #ZimShutdown has not been an exception. Yesterday we published a list of Twitter accounts and hashtags you can follow to keep abreast of things. Today we will share with you some steps you can follow to make sure that you quickly spot fake news. It is important to note, before we begin, that while in the past decades most news organisations placed emphasis on being neutral and thus cover both sides of the story, nowadays that is a very rare thing. Almost every publication out there is partisan to a varying degree even the so-called official sources of information have an agenda. If you add in activists and bloggers ( the internet has made it easy to become a news organisation) then you get a lot of noise. It’s like drinking from a fire hose. Consider the source-check the site or Twitter account and consider whether they have a reputation for being a trusty worthy source. Also make sure the source are who they say they are. Twitter has a blue tick next to the handle for most popular accounts this helps distinguish official accounts from so-called parody accounts that impersonate popular organisations and people. Do not just read headlines– there are a lot of blogs out there who specialise in click bait. They come up with provocative and sensational headlines. Their content (which is often copied verbatim from other sites) does not match these headlines. I know a UK paper that often screams WW3 something something every time there is a tiff between Russia and the US. Check the author-related to tip one but here you are looking at the specific author. Certain columnist have certain biases and even a tendency to try and find flimsy evidence to support their biases. Supporting sources-usually even on social media you will have multiple sources supporting a new update. You need to be careful though as certain lies are circulated back to you as confirmation. Do you have the same video being used as evidence? Are people from various different places claiming that it happened in their country/town/neighbourhood? Then someone is lying. Multiple sources must corroborate something before it is accepted as a fact. Check the date– this might involve you checking the date of the post to make sure you are not reading an old news item which is being recycled as new news. Do a reverse search of images using Google to see if they are really new and not old file photos. Check the meta data of images and videos to determine their authenticity but know that this data can be faked as well. Make sure it is not a joke or satire– it is a wild world out there and something that seems sick to you might actually be funny to other people. There are entire sites and blogs dedicated to creating elaborate jokes and satire. If it sounds too outlandish then it is false. Examples include things like “Man turns into a goat after stealing maize”, “Woman gives birth to a chicken” all these a lies. Consider your own biases- yes you and I are biased. Just consider how this might affect the way you Google and access news. Our religious and political beliefs tend to seek reinforcement. The sites we frequent and the search terms we use often tend to be biased towards what we want to belief rather than what is true. Check with experts-take all in the moment updates with a pinch of salt. File them away and wait for experts to either confirm or debunk them. Reputable sources such as us, CNN, Snopes, BBC, Reuters and AFP eventually examine most facts and pass judgement. Wait on these guys. Can you spot what’s wrong with the Tweet below? Now it is exam time. Can you spot what is wrong with the Tweet below. Leave your answer in the comments.